Comment I am writing you today because I began my own blog, and I use an loose version of your T-theory. I reference you when I use it, but I realized that you may not want someone else posting blogs using your method. I will include some links of how I used them. If you have a problem with this, let me know, and I will remove the posts. Also, for your information, I use Ts when day trading. I create intra-day Ts based on on balance volume. I find they work very well 65-75% of the time. They can range from a few hours to 50 minutes. 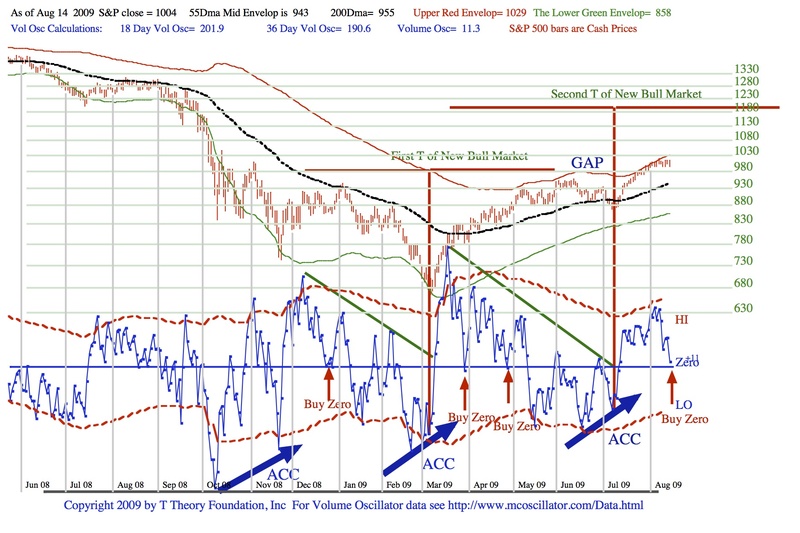 To calculate the progression of the blue Volume Oscillator as depicted in my daily chart above you need to recalculate the 18 day and 36 day Volume oscillator values that are noted in the chart for each successive day beyond this chart’s history. The formulas used are very simple because they are based on exponential moving averages and use recursive equations that are easy to implement in any spreadsheet software package. 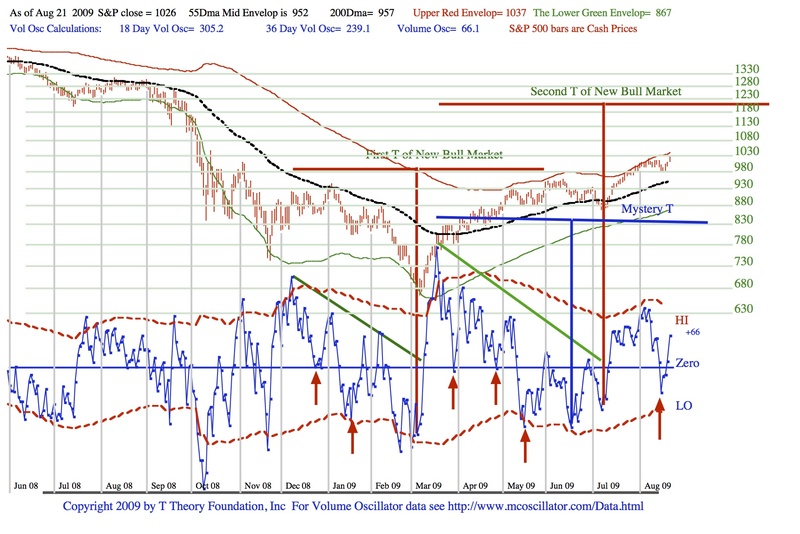 Click on the chart PDF image for a view of the daily August 28 2009 volume oscillator indicators at the top of the chart. I am providing these examples of daily calculations in the daily chart which you can use to check your own calculations or restart the process. I won’t have time to answer specific questions but of course I will make any corrections and listen to suggestions on improvements. If you have an arithmetic problem, it should be easy to find someone that understand the simple math involved. Using a simple spreadsheet is best; it is easy to set up, fast to use, and makes the arithmetic error free. Super trader Marty Schwartz who used this oscillator for some decades claims that one is better prepared to use the day to day pattern for finding bottoms or tops if you plot the oscillator values by hand on real graph paper. Watching the pattern for tops and bottoms evolve from one day to the next gives one better perspective on how this volume oscillator tends to anticipate changes in price trends. The computer generated chart is helpful, but he claims the day to day plot helps to get the better feel for it’s leading characteristics. Be sure you find the number of millions of share traded on the advancing stocks (called the Up volume) and the number of millions of share traded on the Declining stocks ( called the Down Volume) . These numbers will typically run in the range of 300 to 1200. The Up Volume minus the Down Volume = the net volume for the day (in millions of shares) is the only day’s number needed to complete the calculation. The number should be positive on an up day, negative on a down day and tends to vary in the range of plus 900 to minus 900. But to keep the final number in a better range for plotting by hand on graph paper, I take this raw net volume and divide it by 10. So this Reduced Net Volume Change figure is the value we actually use in the calculation. When charted the volume oscillator generally falls in the 100 plus or minus range which more convenient for plotting. Today’s 18 Day Volume Oscillator = 90% of Yesterdays 18 Day Volume Oscillator +1 times Today’s Reduced Net Volume. 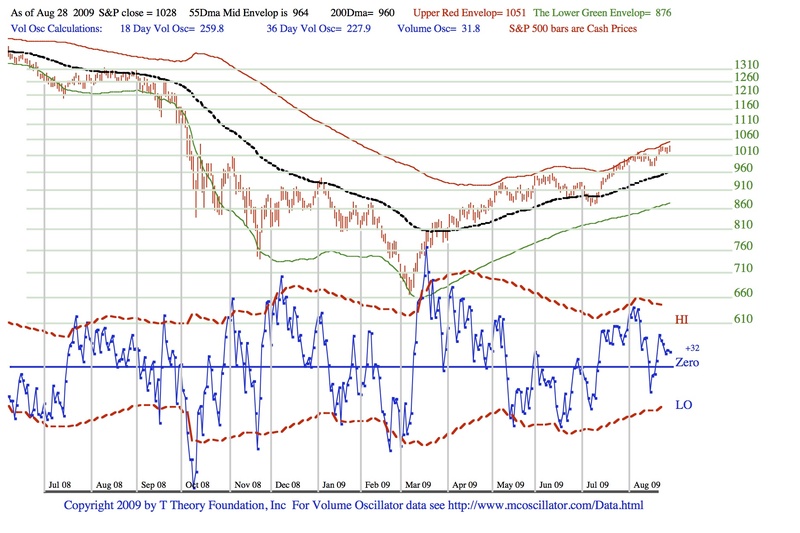 Today’s 36 Day Volume Oscillator = 95% of Yesterday’s 36 Day Volume Oscillator 0.5 times Today’s Reduced Net Volume. To Illustrate the calculation I will discuss how the next days Volume Oscillator value would be calculated from the August 28 2009 data in the chart. For August 28 2009 the chart notes the 18 Day VO= 259.8 and the 36 Day VO= 227.9. The blue Volume Oscillator we really want is always equal to 18 Day VO -36 Day VO, that is (259.8-227.9) = +31.8 according to the chart but should be 31.9 according to readings. The discrepancy is just a round off error in the chart’s print process. Monday August 31 saw the Up Volume was 273 million shares, and the Down Volume was = 1094 million shares; the Net Volume for Monday would be 273-1094= -821 and the Reduced Net Volume therefore would be plus -82 (-82.1 more precisely but not necessary). The August 31 18 Day Volume Oscillator is always = 90% of Yesterdays 18 Day Volume Oscillator (259.8) +1 time Todays Net Volume (-84). The August 31 Day Volume Oscillator always = 95% of Yesterdays 36 Day Volume Oscillator +0.5 times Todays Net Volume . So for August 31 this sample calculation, the final Volume Oscillator calculation would be Today’s 18 Day VO – Todays 36 Day VO, that is 137-175= -37 .
will continue these daily calcs this week here. Update for Sunday August 23 2009 Today’s Topics include; T Theory Tutorial coming this week, a look at the Volume Oscillator S&P chart vs the Advance-Decline Line S&P chart and their relationship, the volume oscillator Mystery T, the need to understand the volume oscillator wave pattern in detail, and my response to most all of the questions received last week. Look over the two daily PDF charts then listen to my long Audio Commentary. The reaction should be finding a bottom here or over the next few days. 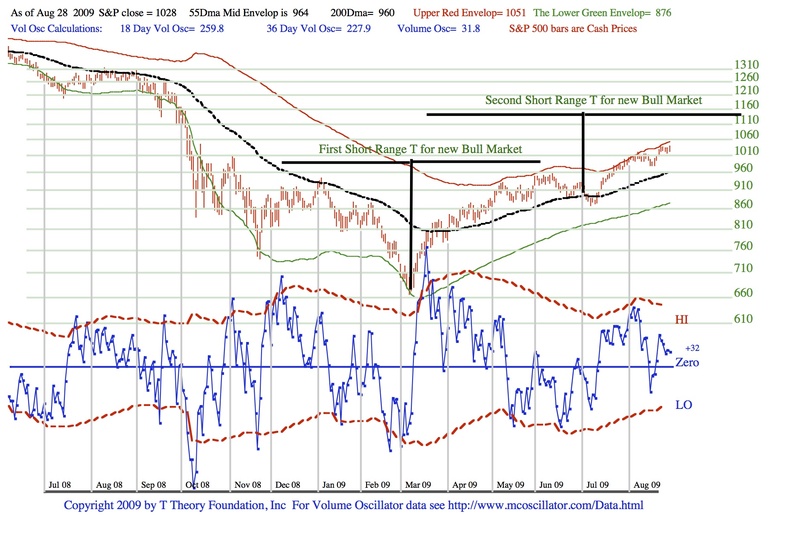 Watch for turning pattern in the oscillator or the market. 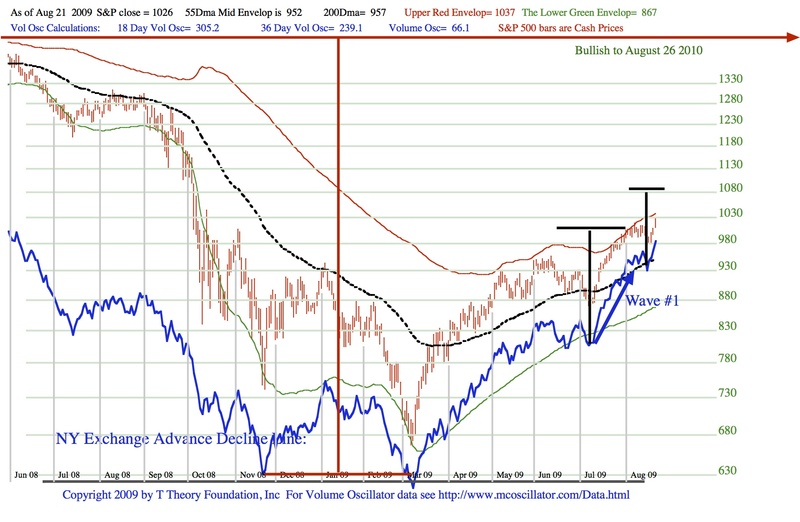 Market should see new highs by early Sept.
Today’s Topics include; Questions and my Answers (Q&A) to; what happens after Oct, where do I learn about T Theory, Greg asks “Marty:day trader or T Theory”, what about rally last week, where to get data for volume oscillator, what about Gold, why is Oct peak is in seasonally weak period, Ji comments by Marty in Stock Wizards, etc. I am taking data from the NYSE UV-DV column as the starting point or should I use the McClellan UV-DV OSc column then divide by 10? Feel like I am close to getting this right and once it is then their will be an updated template for others to use as well. First we will look at the Short Term picture using the A-D Line then I will comment on the small T, etc. Then we will take the same history in terms of the volume oscillator and look at it from Marty’s very short term trading perspective, maybe 7 days or so. 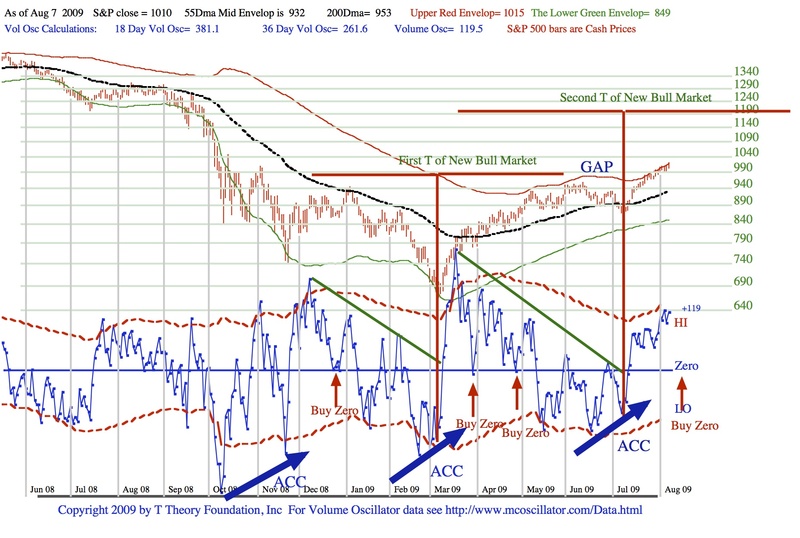 Finally I will answer the question of when a top to the China market might occur and why my volume oscillator numbers don’t quite match those of McClellan site noted at the bottom of these charts. Q and A has been re-recorded due to a mic problem. 1. 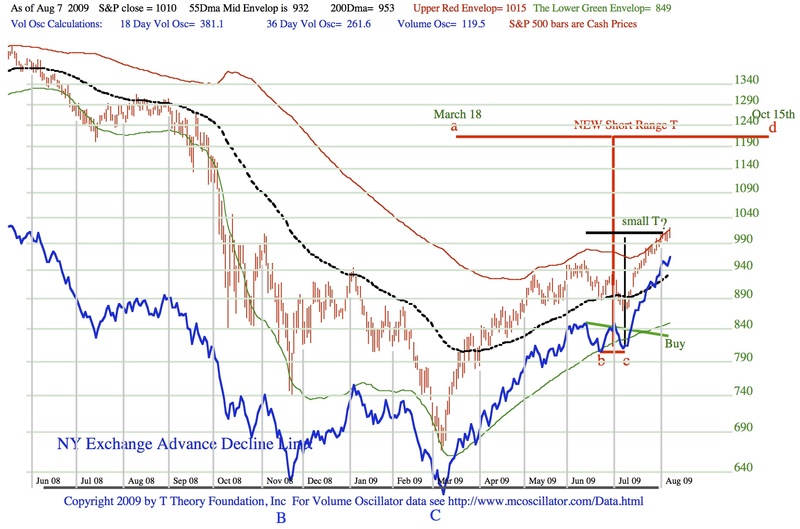 Discussion of the small black T in the AD Line chart that calls for a small, short correction next week. 2. A review of my companies July 31 2009 report and introduction to the concept of “benchmarking”. 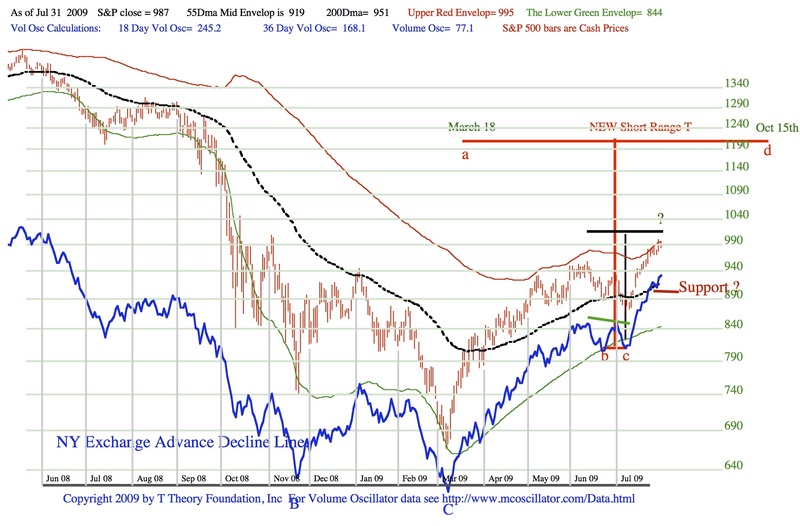 Then read my one page report to clients that begins to talk about strategies and other concepts to maximize the longer term A-D Line Ts rate of return for investments and the Audio Commentary that follows. This entry was posted on April 17, 2013 at 11:31 AM and is filed under . . . T Theory®. You can subscribe via RSS 2.0 feed to this post's comments. You can comment below, or link to this permanent URL from your own site.